Last year when this reviewer received the 63rd issue of Aaj, one of the finest literary review journals in Urdu, it contained five literary gems: short stories by a new writer Ali Akbar Natiq. Each story was irresistible. This reviewer's curiosity had been piqued. The subject matter and essence of each story were different; the young writer's knowledge of life in rural Punjab, control over language, and ability to render the narratives in Urdu was not only believable but intoxicating. At any point in time, we witness the emergence of a cluster of new writers with extremely variable talent and commitment. Gradually, the select few outshine the rest and begin to dominate the literary scene. Urdu nazm has recently found some exceptionally gifted poets and Amer Suhail, undoubtedly, is one of them. First, the similarities: the same beggars with the same whine; the same rows of torn Hessian tents (housing families) wedged in between and, immediately behind, skyscrapers; the same pavements crowded with vendors displaying their wares, allowing little room for pedestrians to walk at ease. This reviewer waited for Natiq's new stories, just as he would wait for the stories of Naiyer Masud, Asad Mohammad Khan, Sanjay Khati, Uday Prakash or Syed Mohammad Ashraf which have graced the pages of Aaj from time to time. Delightfully, the 65th issue, which arrived earlier this year, had two more stories by him, and both lived up to the promise. In fact, the story Qayem Din can arguably be one of the finest to come out of Pakistan in recent years. It has one of the most haunting ending of a short story this reviewer has read in the span of his literary life. Whether the writer is aware of it or not, the story is in dialogue with, and homage to, Intizar Husain's Qayyuma Ki Dukaan, as both stories trace the fall of a mighty but good hearted protagonist, defeated, in one case, by time, and in the other, by nature. "Brother Shadhay Khan," Qamma ran his hand over his moustache and took a long puff at his hookah, "It was nine at night when I arrived at the river bank. Night so dark it would've made even angel Izrael give up ghost. On top of that, the cold, crashing water of Sutlej! I said in my heart, come Qammeya, God is your protector and Saint Chanan Shah your helper, dive! "Shammay Khan, don't call it the Deela Jungle, rather the Snake jungle . . . so fat they can swallow you whole. They don't burp, don't lick their chops . . . By God I have seen many disappear into this jungle. A few I witnessed as they were gobbled up . . . So, brother, soon as I recited the mantar, the bashak naag, kal saar, argan naag, padam naag, khapra, kalchoriya, sangchod, kalehria, in short, all one by one appeared to pay their respects. When neel baniya refused, I turned it into smoke with one puff." Qamma is a larger than life character with a large heart. He could've been rich like others in the business of stealing, but he is often penniless because, "Chacha, what can I say! The whole village arrives to borrow money the day after I steal animals. No one has returned a single paisa so far. The police gets one-third . . ."
There's a wonderful section in the middle of the story that describes how floods affect the villagers. It's the best part of the story in a way. It shows the chaos, anxiety, destruction. "At one in the morning all sat around a radio and waited for the news of the flood. But there was not a word about it in the news. Still the disquiet didn't vanish. Forgetting all about the festival, they kept staring towards the river, as they finally began hearing the river. Around three at night the river rose above its primary banks and began licking the fields, causing panic everywhere . . . but before people could reach their villages the river had devoured earthen walls of their homes . . ."
Qamma helps everyone, wading through rising waters, and points out his mastery in swimming to friends. Qamma and other villagers rebuild and within a year it is as if the flood never came. Life returns to normal. Qamma is back to his adventurous stealing. He's beginning to irk the Rangers though after a daring heist and is eventually caught on his side of the border, arrested and tortured to a point where he is completely broken, mentally and physically. Gradually, Qamma goes mad and become a nuisance, cussing and harassing those passing by and around him. When things get too much, Qamma's son attaches him to a chain tied to a cot or a tree so he won't roam around and be a threat to people. One day the son has to go away with his wife and leaves his father in someone's care. Then the news comes that India has released the water of Sutlej. The flood is coming. Panicked, everyone dashes to safety and in such haste; Qamma is forgotten and left behind, tied to a green berry tree. How the old mad man reacts to the rising level of water as he's unable to free himself is one the most haunting endings ever written in a short fiction. The way he has built up the last scene with inter-cuts of his son, in fact, trying to unsuccessfully reach the village to save his father speaks tons about Natiq's control and understanding of his craft as a writer. Natiq's first five stories, Pagri Baandh Li, Nareena Aulad, Acchu Bazigar, Kammi Bhai, and Bechargi, are remarkable not only for their shrewd, deep and succinct presentation of the Punjabi village and small town society, but for their intellectual depth and complexity. One of this reviewer's favourite, Acchu Bazigar, is told from the point of view of the narrator who suffers from jealousy and inferiority complex with regard to Acchu, who is a bully, a leader, star sportsman at the school, class monitor, a bad student whom teachers keep promoting so he could represent the school in competitions. The protagonist and his best friend, Mahna, are studios and effeminate. Acchu and his cronies pick on them and occasionally the two getting a little roughing up. One of them is even scared of going home after school. Our protagonist lives in dread, though it begins to lessen by each passing year, and he even finds himself cheering for Acchu during his sports stints. Around high school graduation time, Acchu flunks and falls by the wayside, whereas both the protagonist and his friend move on to college and better life. Acchu's fate is shackled by his economic class and he takes up his father's trade of performing at weddings, births and fairs. When the protagonist gets married he invites his friend Mahna at the reception. Acchu comes to perform with his drum and before leaving demands more money, with his hand on his forehead for a salam, since he'd known both since childhood. Mahna doesn't even recognise him and only realises the fact after Acchu has left. The story ends with tears in his eyes. Time has tamed the bully and class politics made sure he remained Legerdemain for the entertainment of the upper class. This particular story brought to mind the wonderful Korean writer Yi, Mun-y?l's Our Twisted Hero, which is also about a bully and a petite, studious boy, who has to suffer the bully's ways. Suddenly a new teacher arrives at the school, who catches the bluffs of the bully and suddenly he is no more. Almost all of Natiq's stories evoke the concerns and themes of serious writers and this reviewer is hopeful he'll keep surprising his readers. He is a typical poet -- intense, original and individualistic. Enveloped in the aura of an abundant, but throbbing painful existence, he is an essential dreamer converting his fascinations into poetry with style and prolificacy. In 2009, his first collection Tayohar Ka Pani attracted the attention and applause of readers and critics alike, earning him the status of a poet with promise. With Mash'had-e-Ishq his second book, he seems to be fulfilling the promise. Mash'had-e-Ishq comprises of ghazals and nazms and Suhail's command is enviable on both. He remains connected with the tradition of Urdu poetry more specifically in ghazal, which is neo-classical in essence and goes with the dominant mood and diction of his time. Previously one could identify the influence of some of his senior poets, which in this book has faded away and this time Suhail is hitting a note of his own. The closer he goes to the classical mood, the more penetrating his couplets become. But Suhail transforms into a modernist when he comes to the nazms. He has successfully maintained a standard throughout, with a vocabulary that is rich and vibrant. 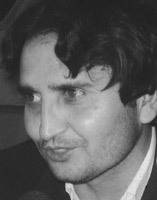 The locale of his poems is quite diverse ranging from Bahawalnagar to Philadelphia and personalities from an ordinary peasant girl to the luminously charming Angelina Jolie. This alternation is consistently found in his works. He seems to long for something unnameable and remains charged with volatile emotions -- which are uncontrollable at times. The dominant impression one gets from his offerings is that of a vital sincerity. He gives himself up to the purity of effusion he craves for as a poet and person. His expression is complex and intriguing, since his thoughts and ideas are not simple or straight. An intense tenderness breathes throughout his lines. But it's hard to spot a single wave of spiritual or intellectual struggle in him. He is in constant grip of melancholy, worthlessness and a quest to reach out for beauty and peace. A vague somnolence makes his offerings hazy and beautiful. Although, he frequently communicates what he wants the reader to feel, a few of his couplets and poems, however, fall short of becoming an organic whole. He misses a beat every now and then. This characteristic can be attributed to the intensity and volatility of his creative trance, which he is likely to tame more effectively with time. His long poem Kahani has been applauded and rightly so by Mohammad Izhar-ul-Haq and Nasir Abbas Nayyar. This unique poem is, in fact, an artistic and organised expression of protest against the merciless slaughter going on in the country for years now. The misery of the common man is extremely traumatic and finds a metaphorical expression in this poem. He's bitterly opposed to the imperialistic exploits of the superpowers but remains intact as a poet -- refusing to turn his poetry into propaganda. His tears are shed on the demise of humans and human values. He is rebellious against the feudalism that chains our rural society and equates himself with the down trodden. The helplessness and the filth surrounding the lives of these "wretched of the earth" is an essential component of his struggle as a poet and individual. Aftab Iqbal Shamim is a little guarded in his preface, though lavishly praises the strengths Suhail has as a poet. Interestingly, Shamim relates Suhail's use of language with the experimentation of the 1960s. I tend to differ, since Suhail, in sharp contrast to the past, has consumed his rich vocabulary in a natural and far more communicative manner. Amer Suhail is definitely an author demanding a more focused and intent reading. His complexity is basically his strength, but he needs to learn to exploit this trait to his advantage more frequently. With two good volumes to his credit, he already stands firm and unshakeable. Food prices have gone through the roof. Don't talk of inflation, says one newspaper, "onions have become the new pearls, tomatoes the new rubies and potatoes the new diamonds." Racketeers are busy adulterating dals. Milk-sellers are adulterating milk with detergents. We have not yet learnt the trick. My friend, Razi-ul-Hasan from Lucknow informs me, with a sad face that he has decided to buy a cow. Cows don't come cheap and my friend doesn't have any space for a cow in his small house, but he is determined. The life of his children, he says, is more important. Women have an identical craze about shedding their dark complexion. Hoardings, showing computer-manipulated 'Before' and 'After' pictures of a moon-faced girl, proclaim that their magic Ayurvedic cream will make you fair in no time. India's population is nearly six times larger than ours which means they have more -- millions more -- dusky girls than we have. I suppose this is why the producers of the miracle creams run such a huge advertising campaign to lure dark females to buy their products. The highly acclaimed actress, Nandita Das, tells us that in her earlier years she was constantly taunted with remarks like "Poor thing, she is so 'dark" and "You have nice features despite being dark." From the time she became a celebrity, she writes, nine out of ten articles written about her start by describing her as being dark or dusky -- or earthy. Realising, that every film and women's magazine in the country told them how ugly they were, Ms Das makes special efforts to interact with young college students most of whom are dark like her. Invariably, she is asked the same question: "How come you are so confident despite being dark?" Nandita Das thinks that with fairy tales like sleeping beauty talking about "Who is the fairest of them all?" the message right from the childhood is clear. In later years it is reinforced in many ways. In popular film songs everyone runs after the gori and the goray goray gaal. The dark-coloured people are kaliyas. One of the most popular numbers still sung with gusto is "Hum kale hain to kya hua dilwalay hain," a blatant and subtle reinforcement that only "fair is lovely." The scams too, are similar. Corruption is a part of life in India just as in our country; only the size and scale is different, Bengal, or West Bengal I should say, is a large province which has been ruled by the Communists -- a party that represents workers and peasants -- for more than a generation. The Communists were known for their simple lifestyle. Today, three decades after they started ruling the state, it is revealed that many comrades live in palatial houses, drive expensive cars, own shopping malls and factories and wear branded clothes. Their sons study abroad; some have a fascination for car racing. Ironically, they are still driven by the same philosophy -- uplift the proletariat. The three Communists, who have been caught, were all zonal committee secretaries of the party in various districts of West Bengal. Their only known source of income was 1500 rupees a month, which they earned as members of the party. How did they amass such wealth? All of them were closely associated with the Central government sponsored projects to improve rural employment and alleviate poverty. The projects had enormous funds; the communist leaders took advantage of the lack of monitoring by the government. One of the Communist leaders was foolish enough to display his ill-gotten wealth by building a grand mansion on twenty acres in the tribal dominated district to which he belonged. The villagers were so incensed at seeing such a huge house in the midst of their miserable huts that in an upsurge, last year, they raided the house and destroyed everything including air-conditioners, refrigerators, and expensive furniture. Apropos of my visit to Mumbai, Aakar Patel who writes in this paper on the happenings in India has written a whole column on my performance, (and Mr Bachan's) at the amphitheatre in Bandra Fort last month. He has said some nice things about me, and I am grateful to him, but I must point out one or two inaccuracies in his account. Mr Patel has written, "He, (Faiz Sahib) would say of Subh-e-Azadi that "Woh to Zia Mohyeddin ki ho gayi." I blush. The poem, Subh-e-Azadi was written in 1947. At that time I neither knew Faiz Sahib (I wish I could say Faiz but my upbringing forbids me) nor anything about reading poetry. I was mildly amused to read that he chose to describe my garb in detail: "Zia Mohyeddin came out to applause wearing a dark suit and tie. His jacket was elegantly cut with the cufflinks showing. He was trim with a full head of hair and looked senatorial…"
I hope I am wrong but I get the impression that he thinks my attire was somewhat incongruous. For his information I have worn similar outfits in all my recitals for over thirty years. My jackets are always well-cut because I don't like wearing ill-cut jackets; I often wear cufflinks; and I never wear a suit without a tie. Mr Patel also says, "Faiz's poetry often has many Persian words and phrases. I imagine he is also a difficult poet for most Pakistanis." Here I tend to disagree with him. Of all the major Urdu poets of the 20th century, Faiz Sahib is the one most easily understood. It is because his intention is never obscure. (A few cognoscente hold it against him) The Persian words that he employs have been the common currency of Urdu poets from Sauda to Ghalib to Dagh to Hali. Faiz Sahib's idealism is couched in lyricism and this is why even the rabid rightists are mesmerised by his verses.